A few months ago I posted a DIY scarf holder. Well, I wasn't happy with it, so I took it apart and reworked it. This picture is how the scarf holder looked when I created it the first time. 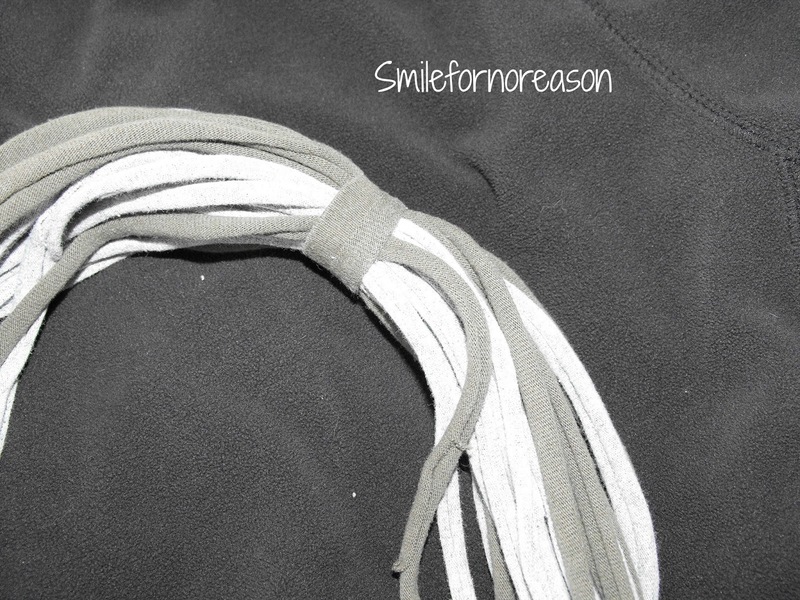 When I added scarves to the shower curtain rings, the bottom of the hanger was bending slightly as you can see in this picture. 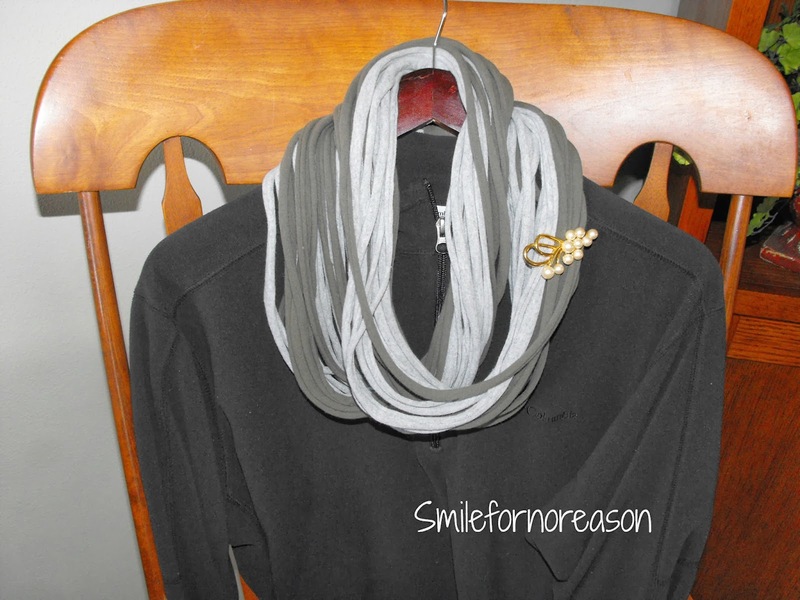 When I added more scarves the hanger was extremely bent and I was not happy with this. I took all of the shower hooks off of the hanger and put them back on the hanger on the top bars of the hanger. Attaching the shower hooks in this fashion makes the holder more sturdy. I can add more shower hooks now, and not be afraid of the hanger bending in half. 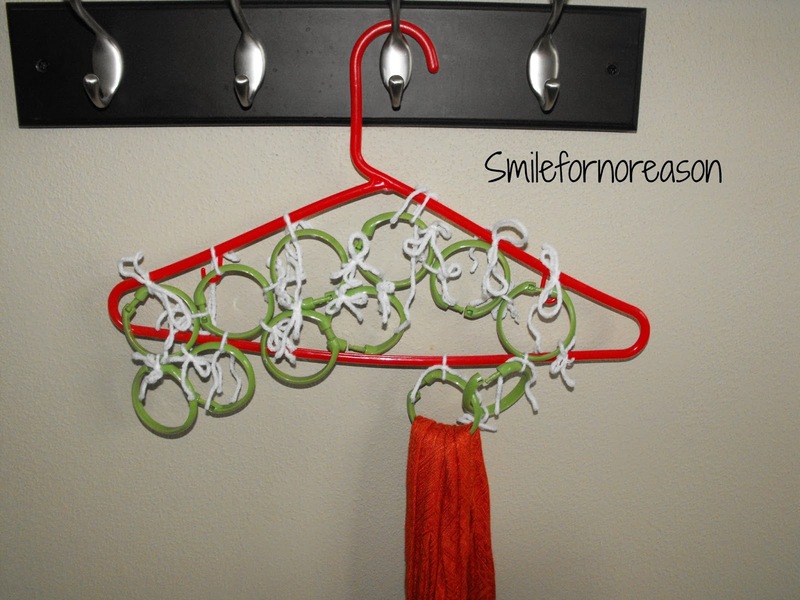 I noticed that I had some empty hooks when I took a picture of my reworked scarf holder. Now I must get busy and create more scarves to fill those shower hooks! Here is the link to create one of these scarf holders. Let me know how you store your scarves in the comments below. More storage means more scarves and Jo-Anns has a large clearance aisle. Just saying! 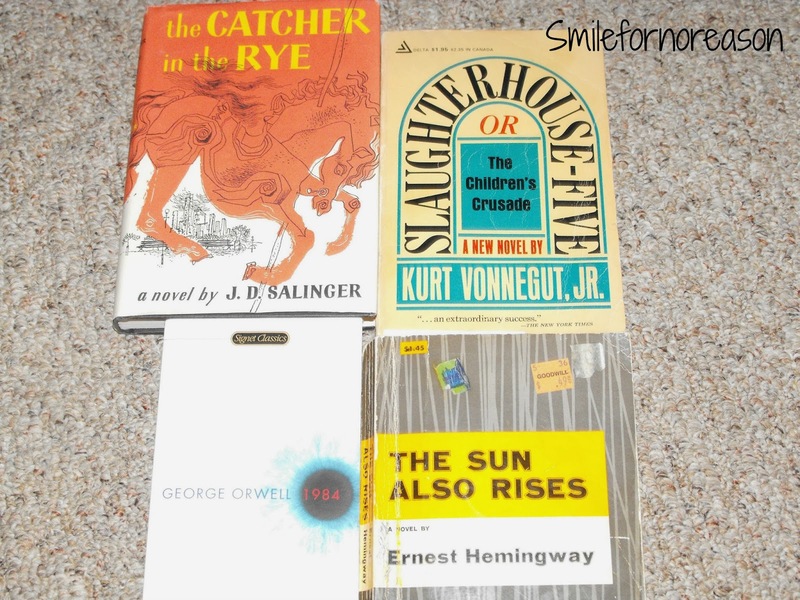 Photo Challenge...What are you reading? I absolutely love to read. Put any book in my hand and I will read it. Books helped me to escape my junior high and high school years. 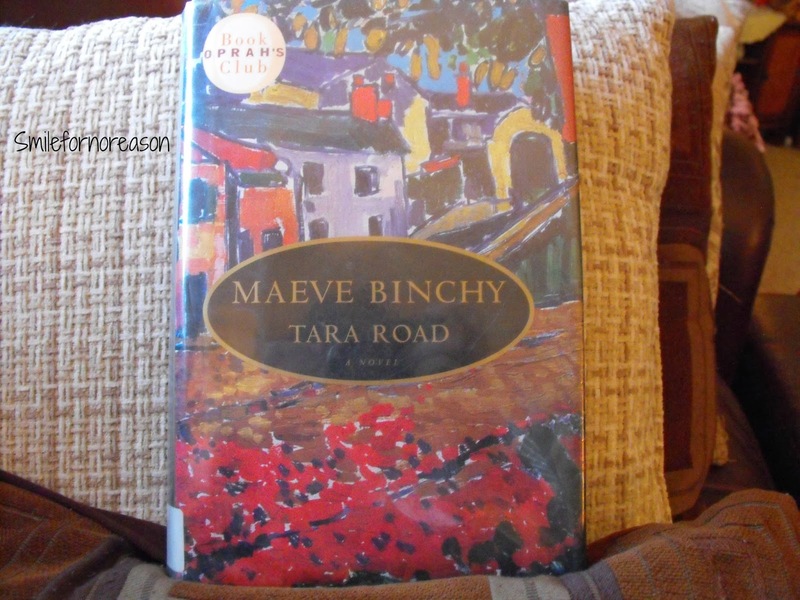 They transported me to far away places and I got caught up in the lives of the characters in the books. Salvation Army are great places to find classic books. I visit my local library constantly. These books are just two that I have mentioned on my blog. A very interesting book about how art was an integral aspect in World War 2. After reading this book I am excited for the release of the movie on Feb. 7. My handsome husband bought me a Nook for Christmas last year. I am able to download a book from a website. And my local library has an option to "borrow" an ebook. As you can tell books are very important in my life. In fact, my handsome husband tells me I am too "fidgety" when I do not have a book in my hands. 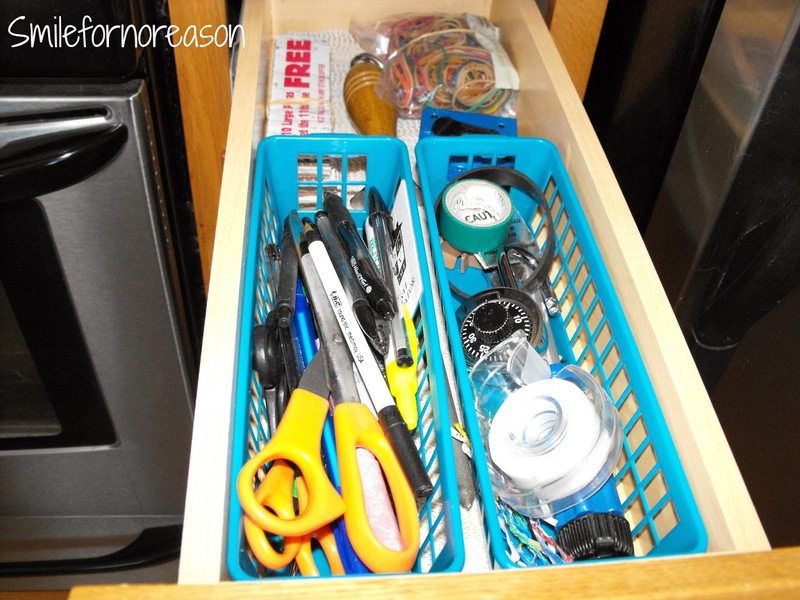 2 More Kitchen Drawers Organized! 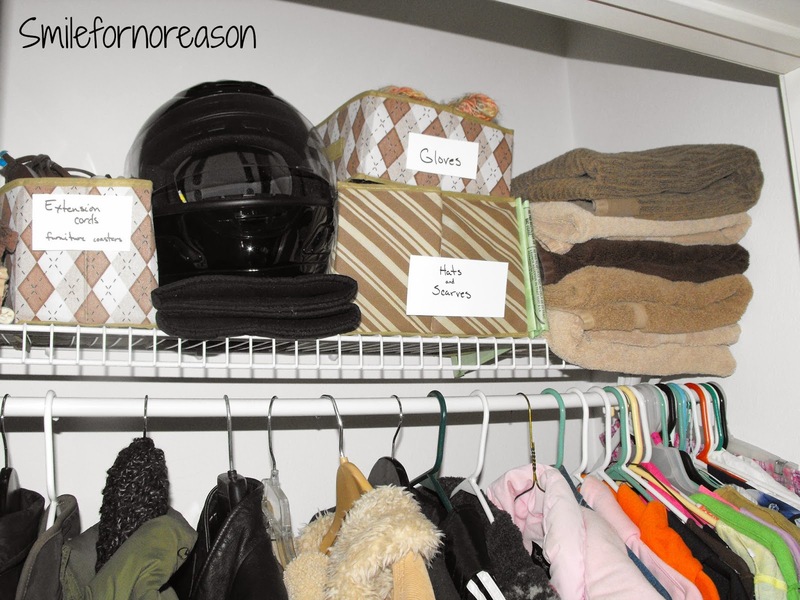 With this weather being the way that it is, it leaves much time to work on organizing my house. Would I rather be outside, well yes, but enjoying being warm and tucked away in my home is nice also. Especially with a warm mug of hot tea. I measured the drawers that I was going to work on next and bought some new containers to fit. 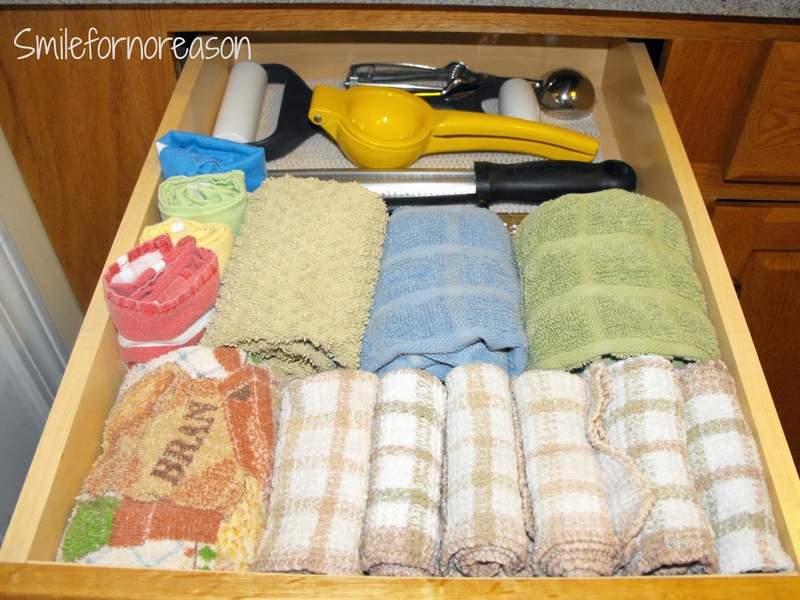 When I had organized my dish towel drawer, I moved some kitchen utensils to that drawer freeing up space in my silverware drawer. 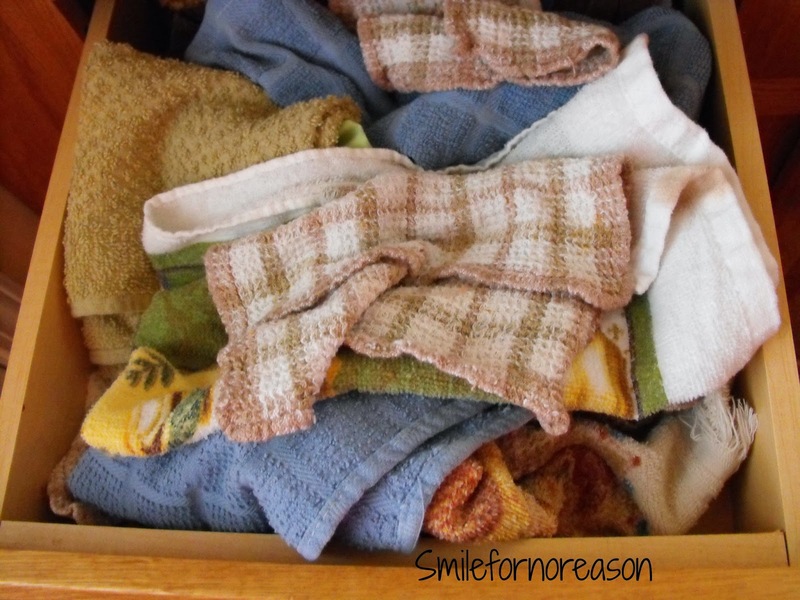 First, I completely emptied the drawer and washed it out. 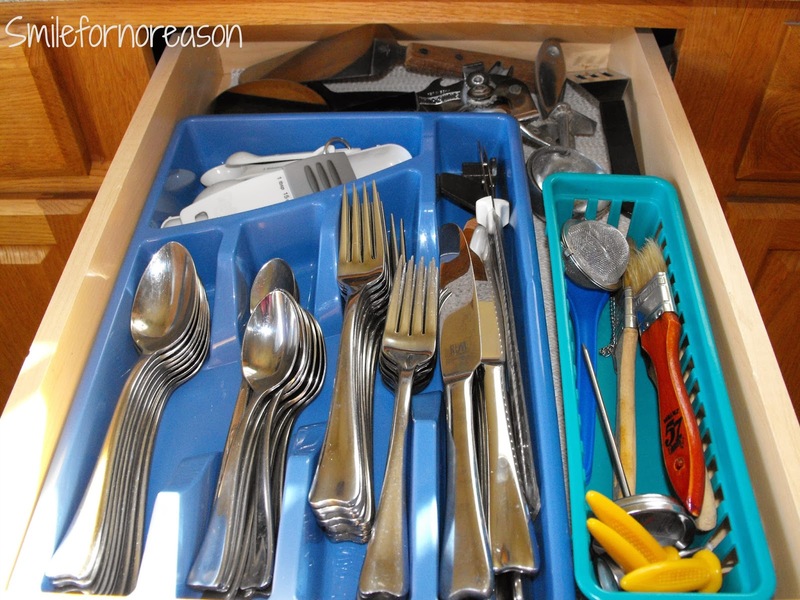 Then, I put a non-slip contact mat on the bottom of the drawer and started putting the silverware drawer back in order. This did not take me long to organize. The most difficult part was waiting for the weather to warm a little to venture out to the store. The containers I purchased came in a bundle of 3. So I had containers to start organizing another drawer. So that is what I did. Onto the junk drawer. 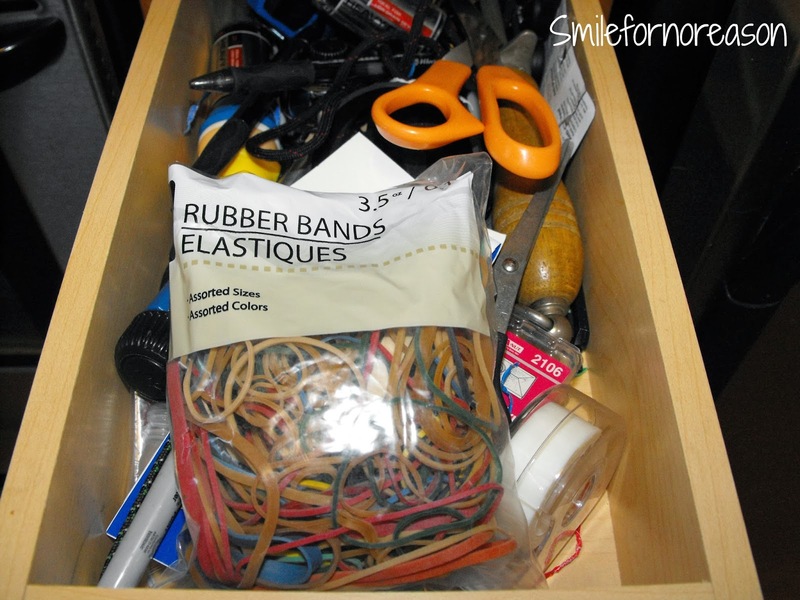 Any question as to why this is called our junk drawer? What in the world is in here? First, I had to totally empty the drawer and wash it out. I used the last remaining non-slip contact mat in this drawer. I put the pens into one of the containers. I put the batteries in a container and moved those to a shelf in the basement. I put some things in the garage for my handsome husband to put with his tools. Basically this drawer was a catch-all and I just needed to put things back where they belonged. I am very happy with my kitchen cabinets and drawer organization. I am most happy that you are all doing this with me. It has been fun sharing my experiences with you all. I have one last cabinet to do in the kitchen. My pots and pans cabinet. My handsome husband has some of the kitchen deconstructed. We are putting open shelves in the kitchen. We are waiting on warmer weather before starting this project. 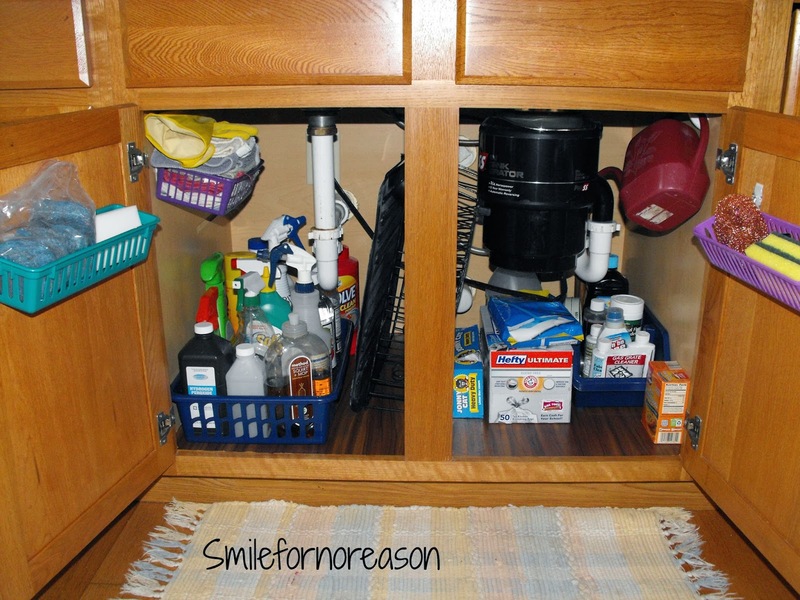 So I will work on the rest of my cabinets when that project is finished. 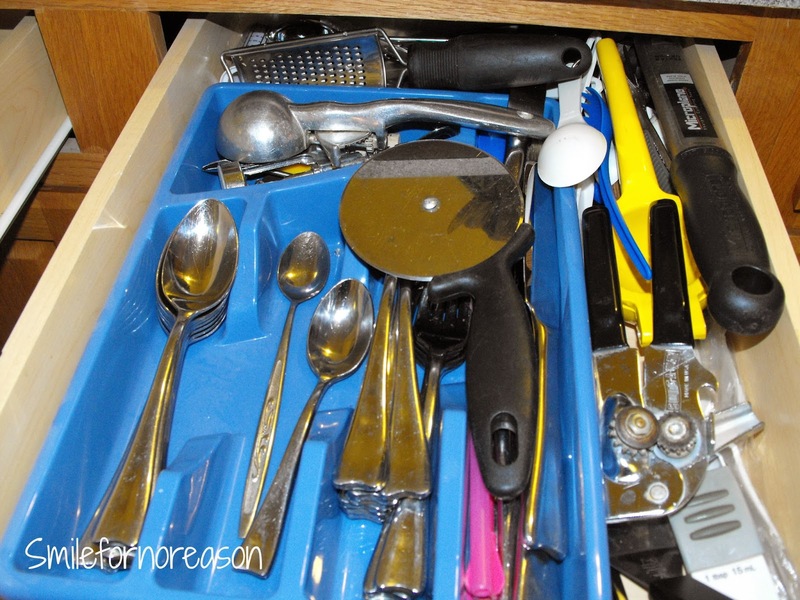 After I am finished with my pot and pan drawer, I will be tackling my bathroom drawers. I just might get my whole house organized before we thaw from this deep freeze. Oh well, as long as we have hot tea, all is good! How Many Scarves Does One Person Need? So once again, I was perusing other blogs and I came across Flatrock Cabin demonstrating how to create a scarf using old t-shirts. Well now, this sounded like something I needed to try. I bought two t-shirts from the Salvation Army. I washed and dried them. Then I started cutting away. But first, here is a picture of the finished scarf. 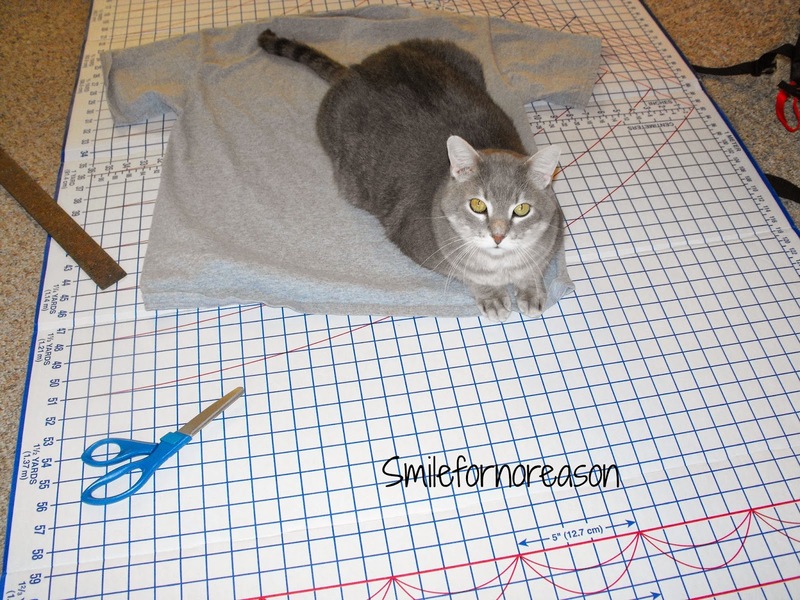 I laid the t-shirt on my cutting board and pressed out all the wrinkles. Charlie helped also. Please do not believe that innocent look on his face. 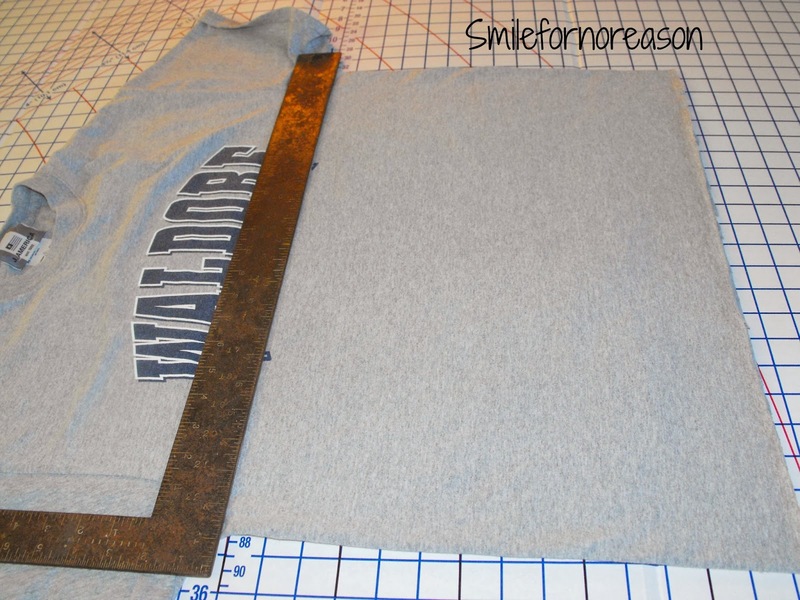 I placed a carpenter's square across the bottom of the t-shirt and cut off the hem. I moved the carpenter's square to just below the underarms of the shirt. And cut off the shirt. This left a wide band of t-shirt. I cut the shirt into one inch wide strips. 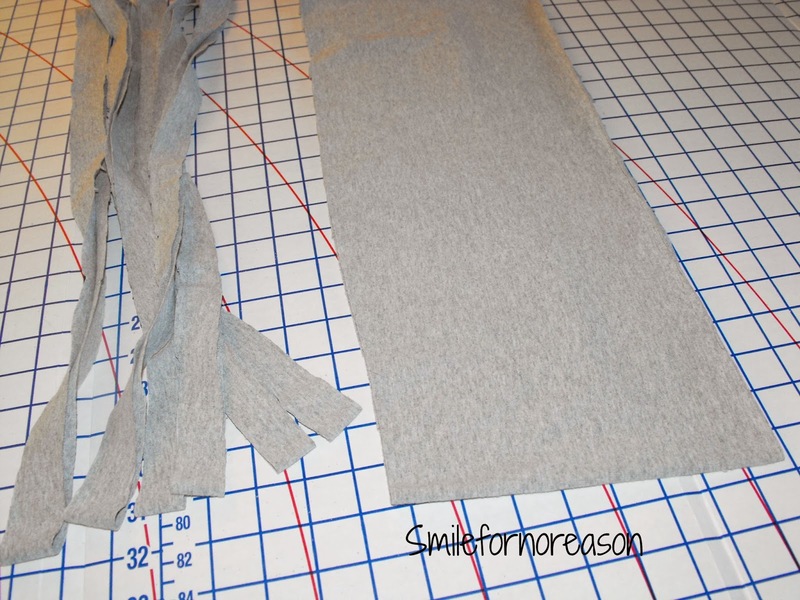 This is a picture of the shirt cut into one inch strips. Gather all the strips together in your hand and start stretching. 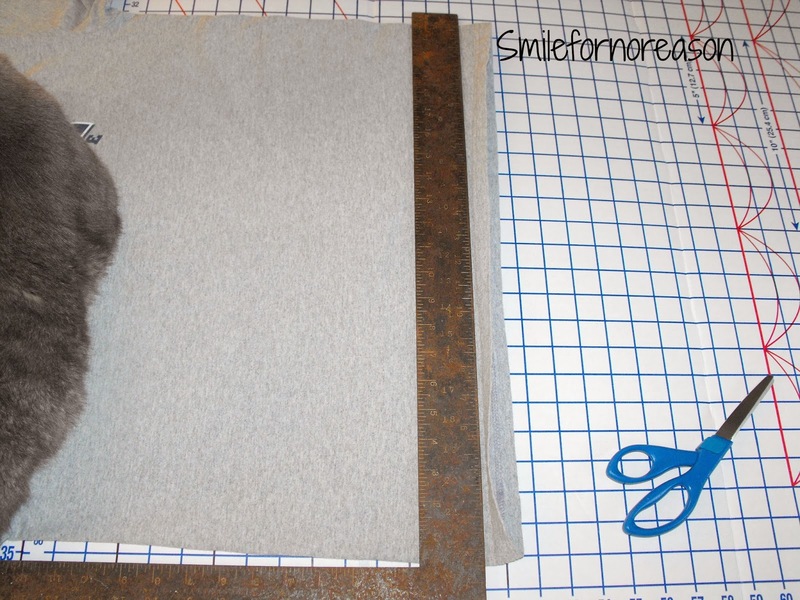 I used a door handle to help me stretch the fabric. I put the scarf around my neck and my handsome husband said it looked as though the scarf was strangling me. My very smart family told me to get the fabric wet and then stretch the scarf. Well, my very smart family was right and it fit better around my neck. I bought two shirts and started cutting the other t-shirt in the exact same way. I wet this shirt also and stretched and hung both to dry. I used two scarves. I preferred the fuller and bulkier look of the two scarves added together. 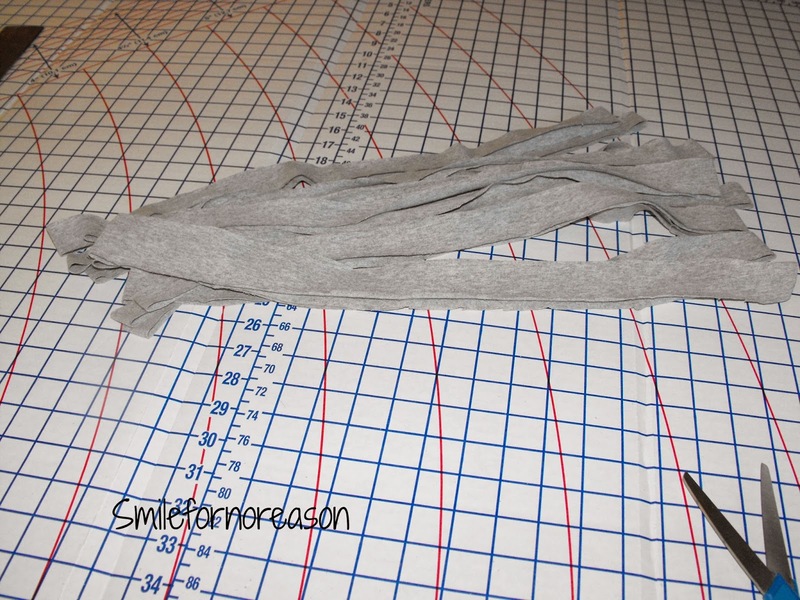 When the scarf was finished drying, I cut a small section of the hem of one of the shirts and tied it around the scarf to keep the strands together. In this finished picture I added some bling to the scarf. I felt the broach "fancied up" the scarf. Honestly, a girl can never have too many scarves. Can I get a Woop Woop for this Body Lotion? 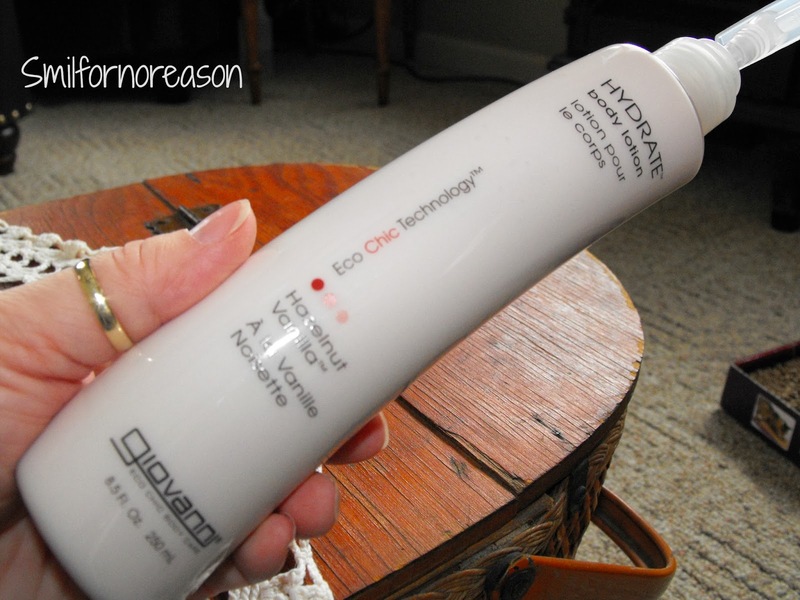 This lotion is my new favorite! I bought it from the website, Vitacost. I live in a small town that does not offer many natural, organic, or cruelty free options. So I shop at Vitacost whenever I can. 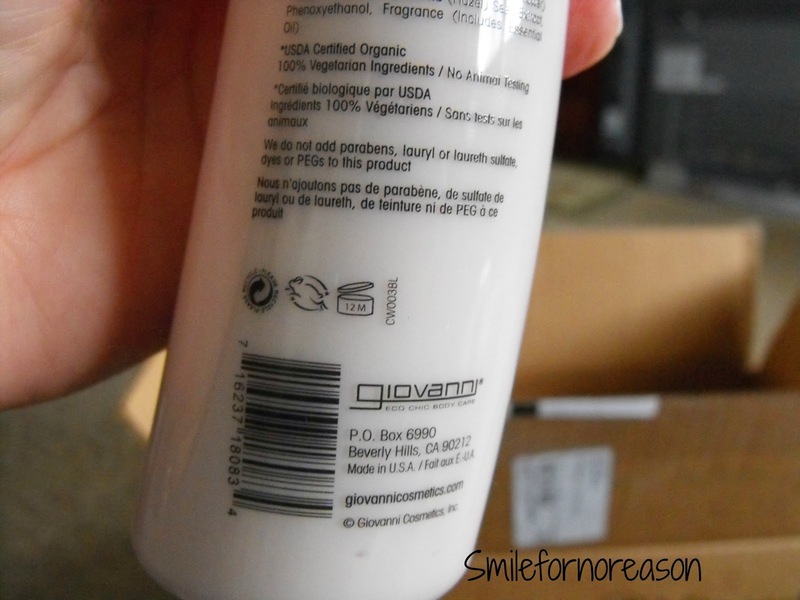 This is the Giovanni Hydrate Body Lotion. This lotion is thick and luxurious. You rub it into your skin and instantly your skin has the soft feel of velvet to it. 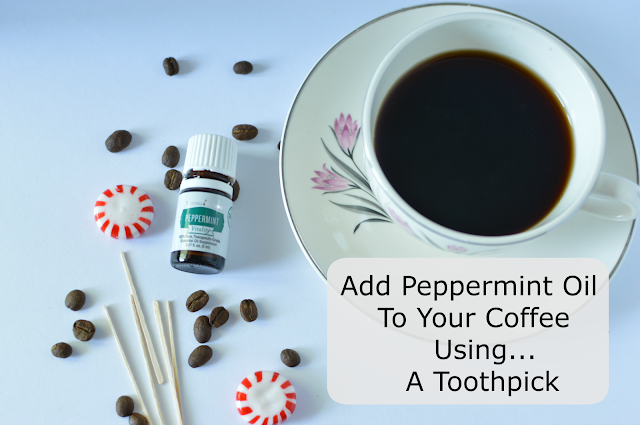 It is instantly absorbed into the skin. Whereas other lotions sit on top of the skin and makes a greasy mess whenever you touch anything. I can rub this on my skin wait 30 seconds and be able to touch any touch screen lap top or phone. The fragrance is hazelnut and vanilla. One scent does not over power the other scent. It has a soft chocolatey fragrance. It is not a sickly, too sweet, smell. The fragrance does not linger. You will be able to put on perfume without the smells clashing. The price is $6.97 on the website. An affordable price for such a wonderful body lotion. Let me know in the comments below of lotions that you love. This time of year our skin can always use a little help. Now last week, when I read that the word "organize" was the word to photograph this week I actually went "woohoo." 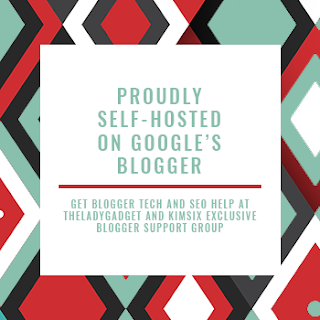 But then reality set in and I wondered if maybe "organize" before you found Google + and all of the wonderful advice on this topic was more appropriate for me. 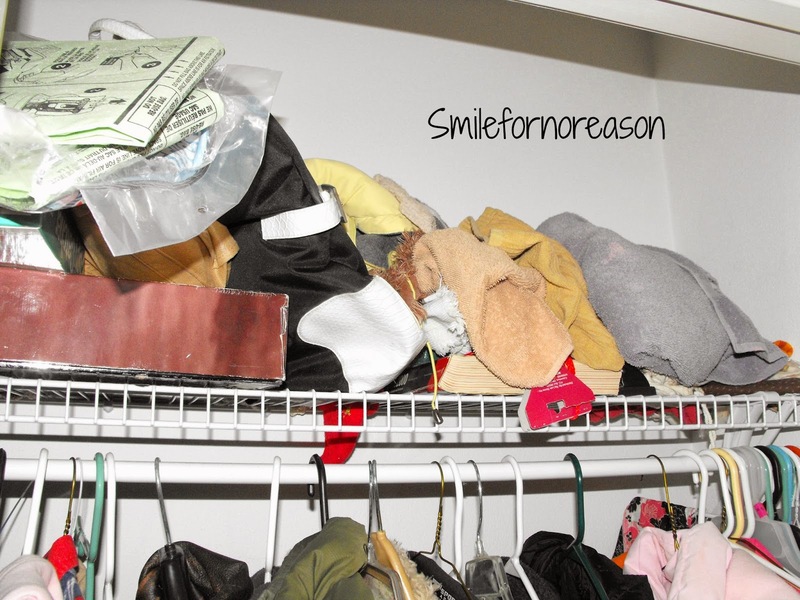 I am the poster child on how "not" to organize and allow your closets to get out of control. But you know what, that is in the past. With my new information, everyone else's ideas, I am more aware on how to maintain and organize everything in your life. 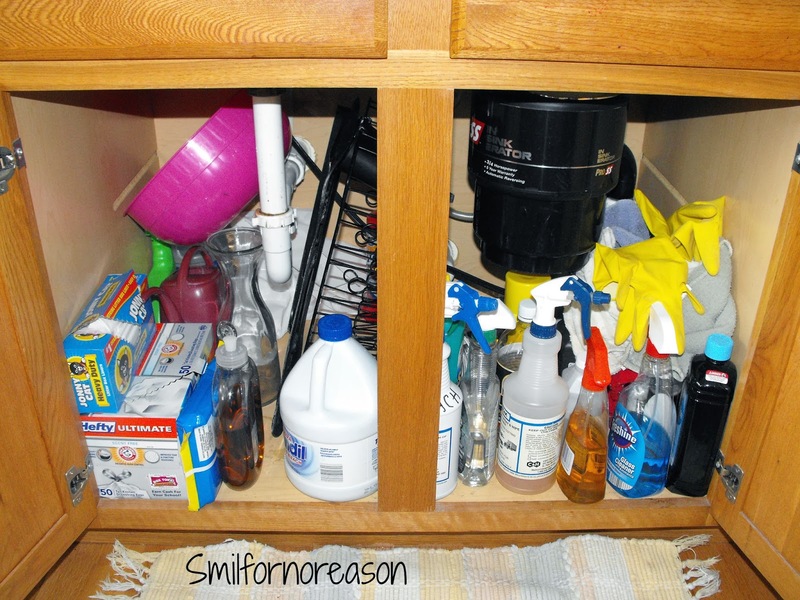 For example, I have been working on organizing my closets, under the kitchen sink, and kitchen drawers. I have also been learning how to organize my live with a daily planner. Before daily planners would give me stress and a headache, but now I can't live without mine. 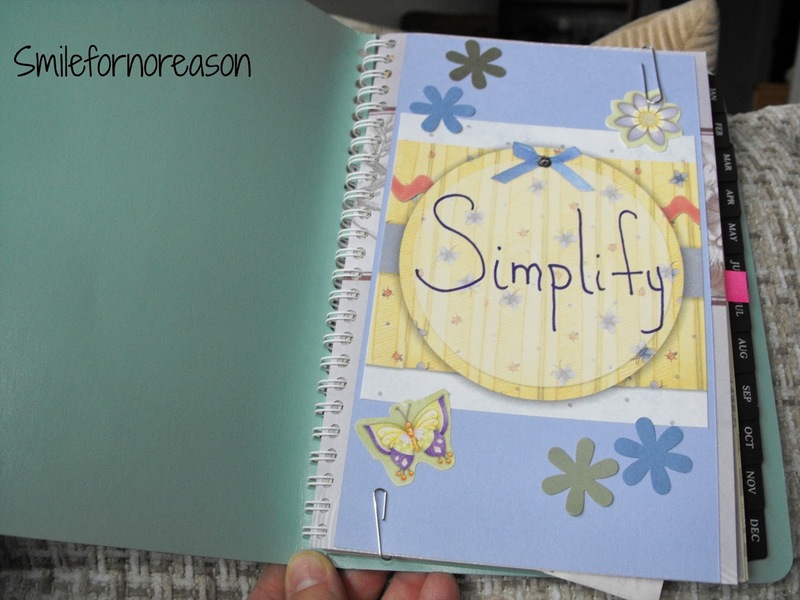 I love decorating it and making it "my own" to fit my personal needs. With my new found information, I hope to never go back to these places again! With Valentines Day approaching, I decided to throw together a card. 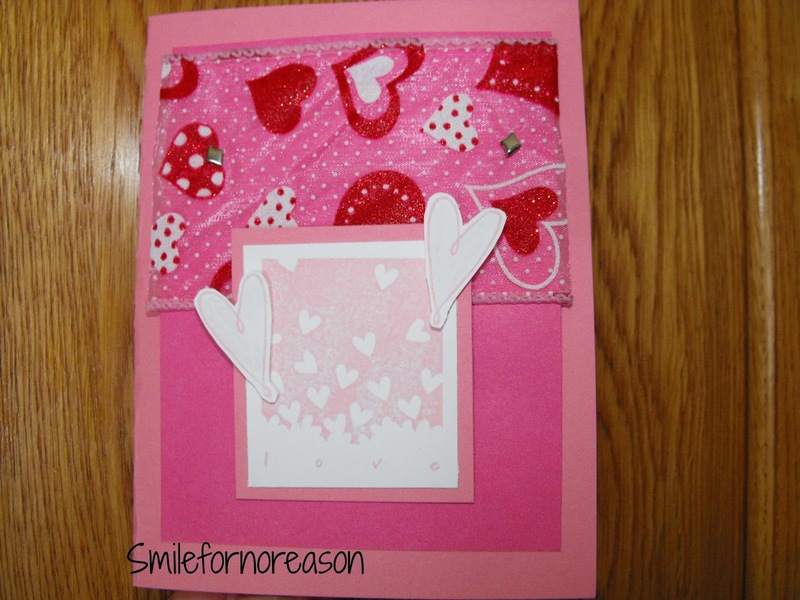 I chose different shades of pink and created this card. I gathered together all of the items needed to put the card together. I picked an appropriate stamp featuring hearts. Ribbons with hearts. Pink ink and pink paper. 2 silver brads. Dimensional dots, to add layers to the design. I started cutting and gluing things together. And I was finished. It actually took me longer to gather my scrapbooking items together and then put it all away than creating the card. As I look at this blog post, this post is so pink, I gotta wear shades. 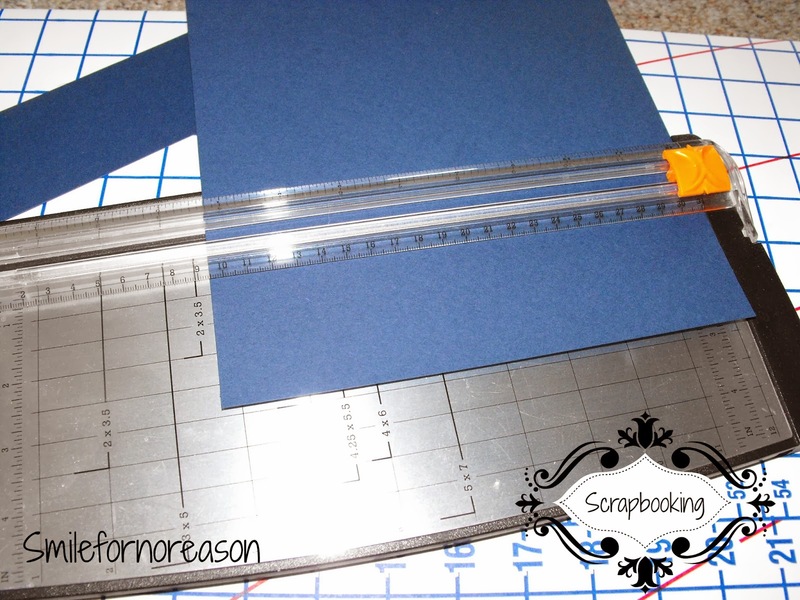 When I cleaned out and organized my coat closet, I was able to get at my scrapbooking supplies. Because of that I have started creating cards to give to others. Now I know that at The Dollar Tree they sell cards for .50. Great price. But, I enjoy creating cards for others. 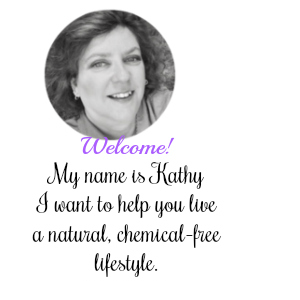 And since joining Google+, I have come across awesome blogs to get ideas for my cards. For example, Jenn at Jax Bean Stalks. Beautiful creations! 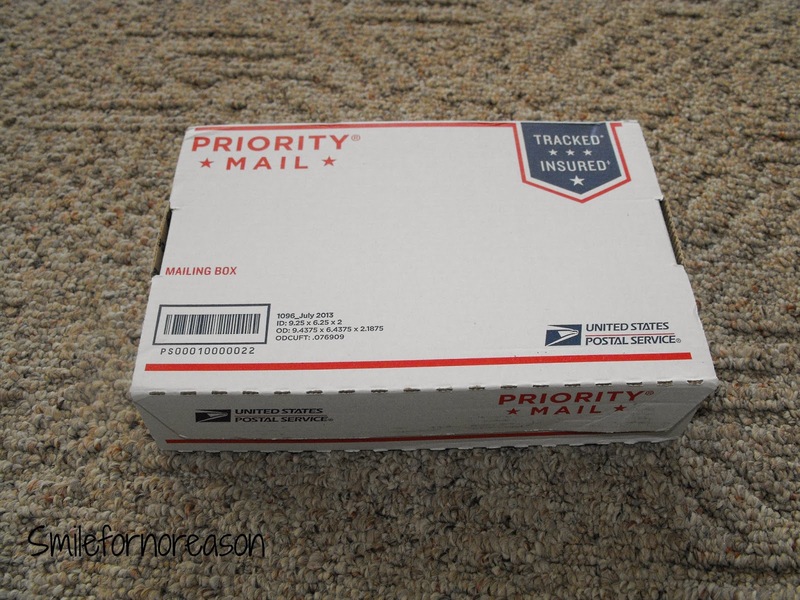 Stampin Up, Jo-Ann's, or on line tools. 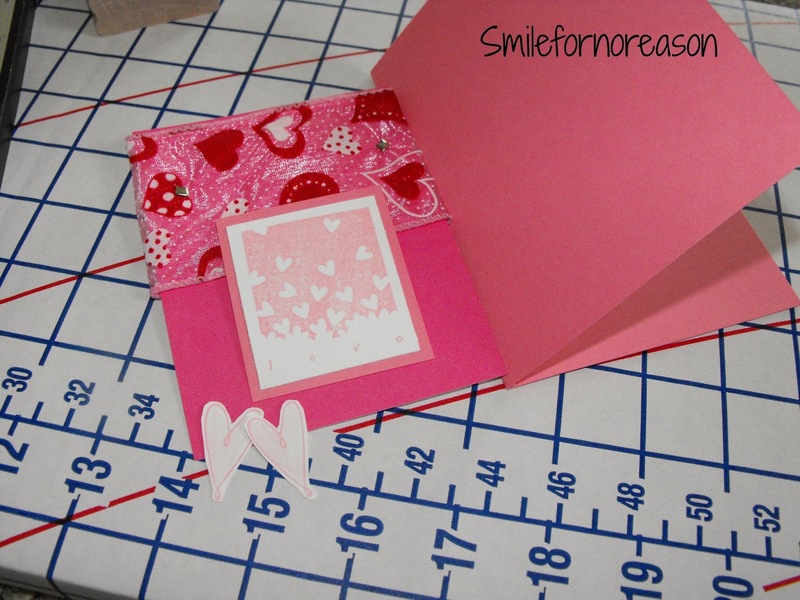 I created a birthday card recently and I want to share the steps I used to make it. 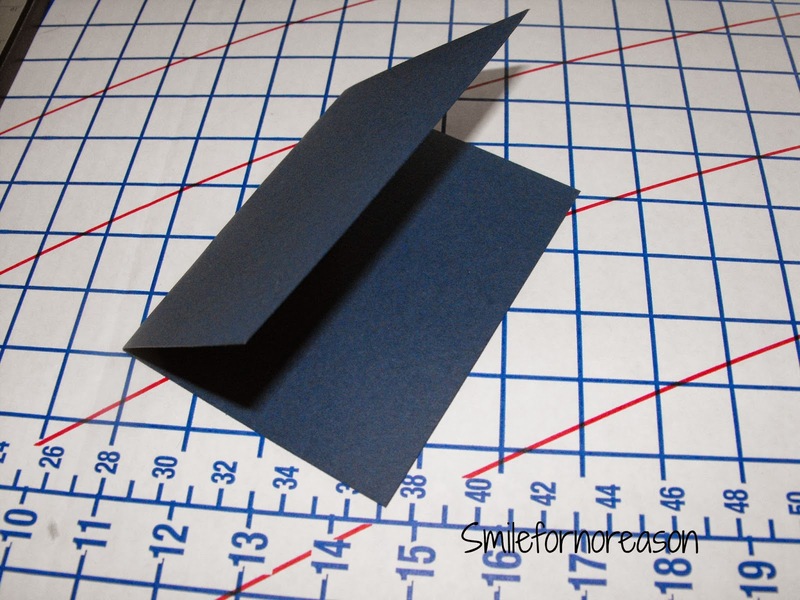 Using cardstock paper, I cut my base card at 21 and half inches long by 14 inches wide. I folded the paper in half. This created a blank slate to create whatever came to mind with collaborating colors. 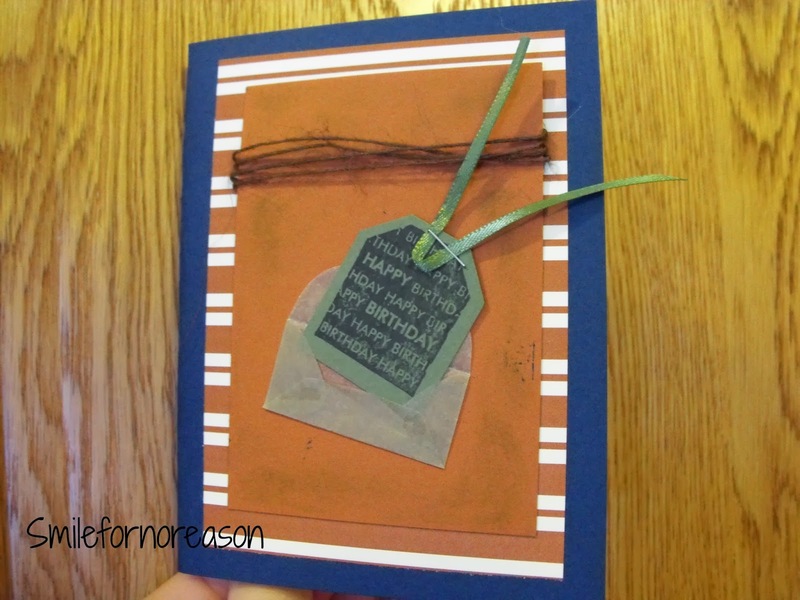 I am making this card for a young man who is turning 20. So I chose a blue and brown color combination. 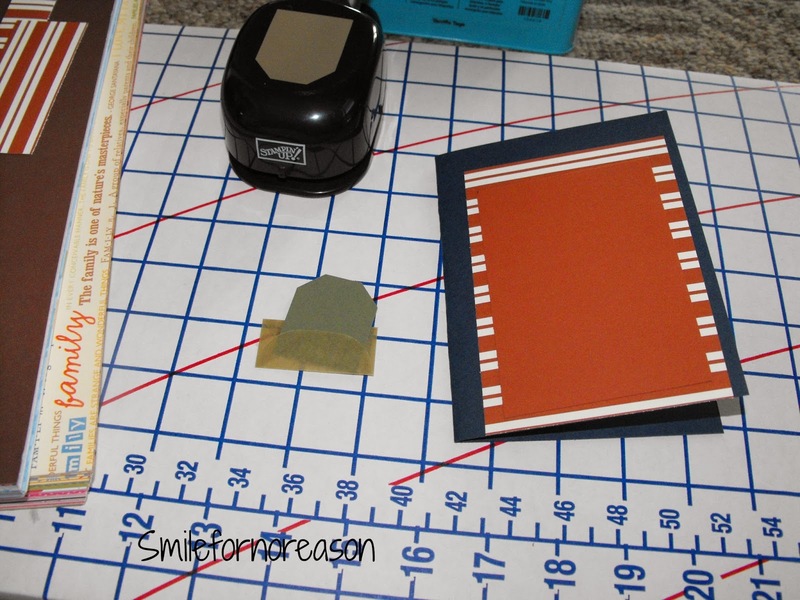 First I glued the striped paper to the blue cardstock. Using a punch I created a small tag. 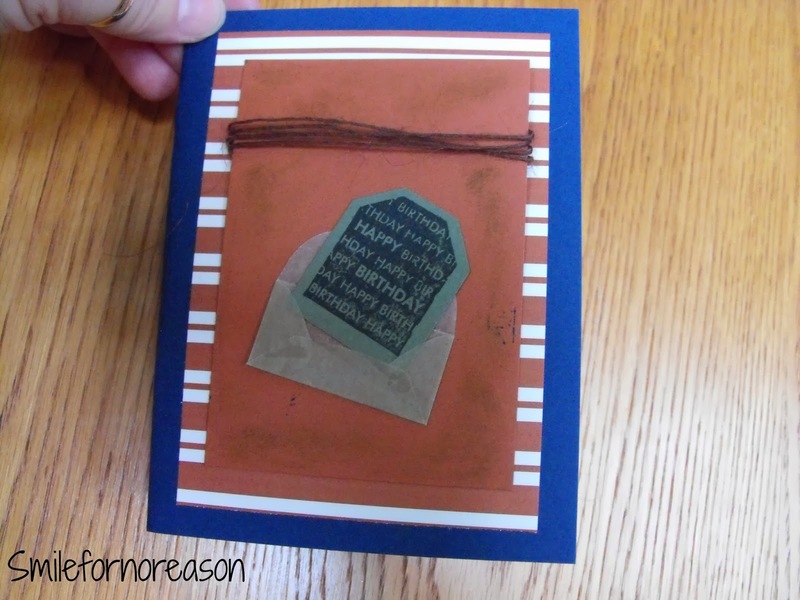 I used a rubber stamp and added Happy Birthday to the tag. I found a small pre-made envelope and stuck the tag into the envelope. 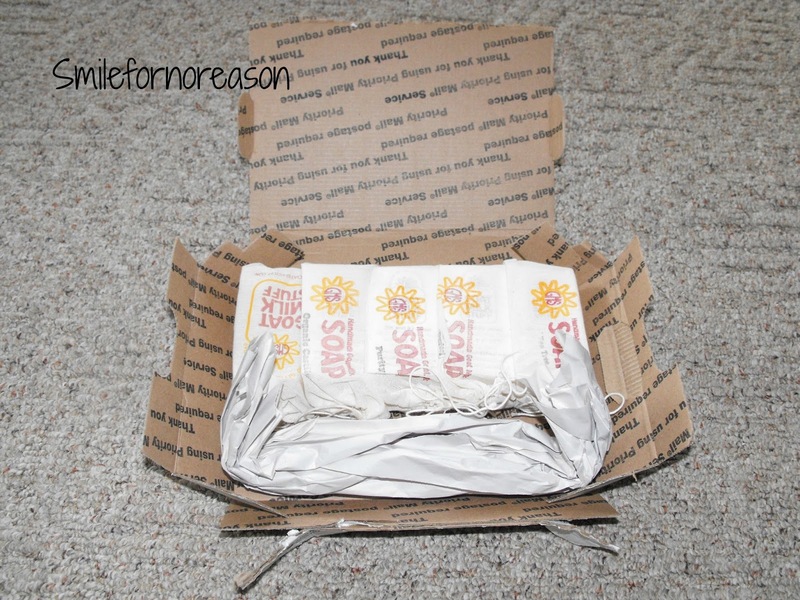 I wound twine around the top of the solid brown paper and glued everything together. I wasn't pleased with the result, so, I antiqued the solid brown paper using a sponge and olive green ink. I still wasn't pleased. So I stapled a bit of ribbon on the tag. Photo above. I glued a blank piece of plain cardstock to the inside of the card, where I will either stamp with a rubber stamp, or write by hand, Happy Birthday. Finally, I'm finished. Leave me links to your card creating ideas in the comments below. I am interested in everyone ideas! *Disclaimer-I am not being compensated for the opinions expressed in this post. For a while now, I have been using goat milk soap as my body and face wash. 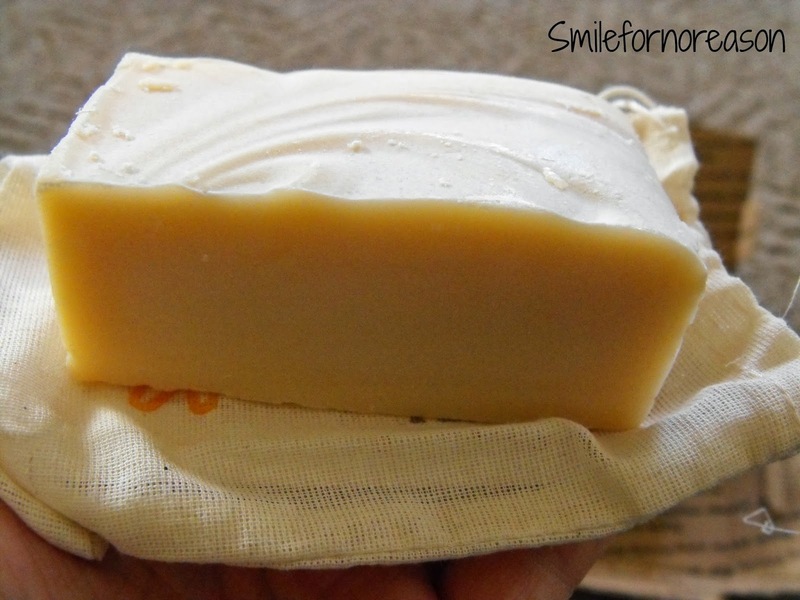 When I started researching more natural alternatives to soap, I happened across a you tube video discussing the benefits of using goat milk soap. This video (I do not remember the video to link it up) was discussing products they used from the company, Goat Milk Stuff. So I researched the company and bought some of their bars of soap. I was not disappointed. Doesn't this look good enough to eat! Oh no, please do not! 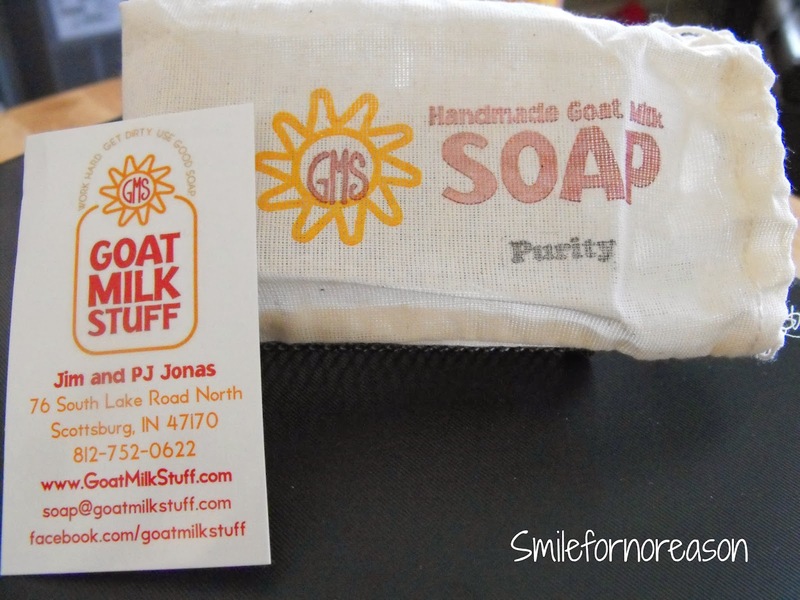 For information on the top ten benefits of goat milk soap click here. You are asking yourself, yes, sounds good, but how well does this soap lather? I no longer get breakouts on my face. I do not have to rely on body lotion, but I still use body lotion, in fact I recently bought some great lotion, I digress, because this soap does not dry out my skin. And my husband has started using it also! Note though-if you get the soap in your eyes...It Stings! They over a wide variety of scents, but I choose to stick with the natural scents of purity, tea tree oil, and organic castile. I have tried the lavender scent and it smells wonderful. 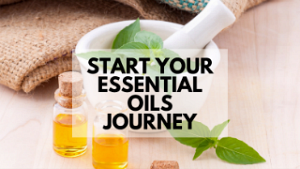 When you checkout at their website while purchasing, there is an option to sample up to 3 different scents. These samples are just small cuts of the soap. A great way to see if that particular scent appeals to you. How well do they treat the goats? They allow the goats to roam free. Each of the goats have a name. And they even took a goat with them when they traveled to be on the Dr. Oz show. 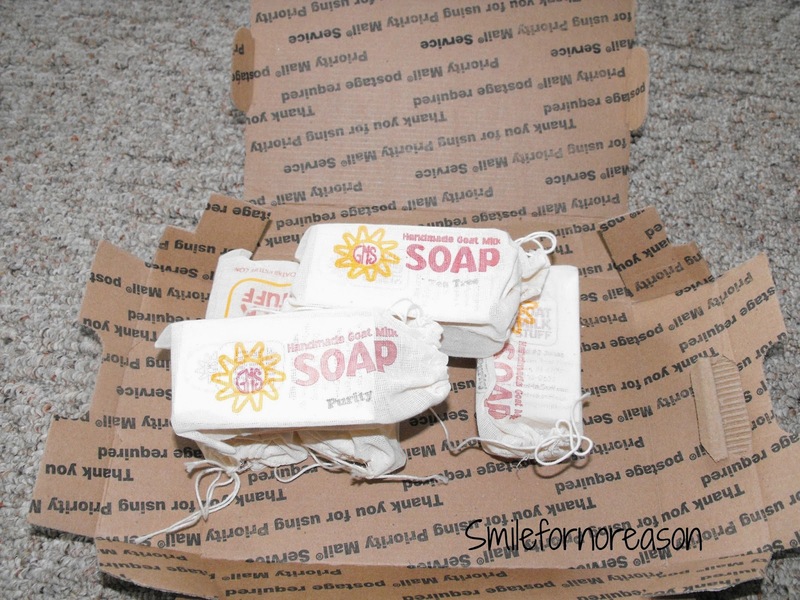 The soaps are packed tightly to reduce any breaking while shipping. Each bar is approximately 5 oz. Soaps are sold in half bar size as well as soap logs. Prices vary from $6.00 for regular bars or $6.50 for essential oil bars to $8.00 for specialty soaps. Each bar is wrapped is a cotton drawstring bag which allows the bars to breathe and friendlier for the environment. I keep these bags and use them to keep other items in the little bags. Each bag also contains business cards to keep in your wallet. Let me know if you have tried these soaps. Or if you have tried any other types of soaps that are just as natural? Another drawer organized...and on we go!